"The DuraFlex Roof Worker Kit provides everything that you need for working on roof tops, in a convenient carry bag. Kit contains: DuraFlex Roof Worker Harness, 15mtr anchorage line with a type 1 fall arrest device, webbing tie-off adaptor and sports car"
If you are a roof tiller, solar panel installer, plumber, electrician, builder, air conditioning installer or antenna installer, you will have to work on a roof at some stage. Roof work, like any other work at height, is a risk, and appropriate products and methods should be used to protect those working. 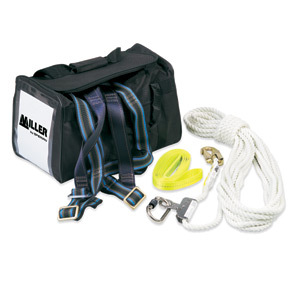 The Miller Roof Workers kit has been designed to allow workers in situations where roof work is required, and easy all in one kit, that packs neatly and easily into a sports bag for transportation and moving from site to site. - Refer to AS/NZS 1891.4 for information on anchorage selection and strength.